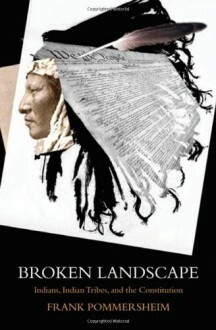 Broken Landscape is a sweeping chronicle of Indian tribal sovereignty under the United States Constitution and the way that legal analysis and practice have interpreted and misinterpreted tribal sovereignty since the nation's founding. The Constitution formalized the relationship between Indian tribes and the United States government--a relationship forged through a long history of war and land usurpation--within a federal structure not mirrored in the traditions of tribal governance. Although the Constitution recognized the sovereignty of Indian nations, it did not safeguard tribes against the tides of national expansion and exploitationAs Broken Landscape demonstrates, the federal government has repeatedly failed to respect the Constitution's recognition of tribal sovereignty. Instead, it has favored excessive, unaccountable authority in its dealings with tribes. The Supreme Court has strayed from its Constitutional roots as well, consistently issuing decisions over two centuries that have bolstered federal power over the tribes.Frank Pommersheim, one of America's leading scholars in Indian tribal law, offers a novel and deeply researched synthesis of this legal history from colonial times to the present, confronting the failures of constitutional analysis in contemporary Indian law jurisprudence. Closing with a proposal for a Constitutional amendment that would reaffirm tribal sovereignty, Pommersheim challenges us to finally accord Indian tribes and Indian people the respect and dignity that are their due.